Sea Gem: Reef is a project with multiple outputs that has been generated from research into Sea Gem, the first rig to extract significant hydrocarbons from the North Sea in 1965. Later that year it became the first offshore rig disaster when it sank to where it now sits on the seabed. As North Sea oil and gas production is declining, attention has turned to the decommissioning of oil platforms and their potential benefits as anthropogenic reefs. The story of Sea Gem follows a trajectory of the hydrocarbon industry, from first discovery to future decommisioning and offers ways to reconsider human interrelationships with the North Sea. 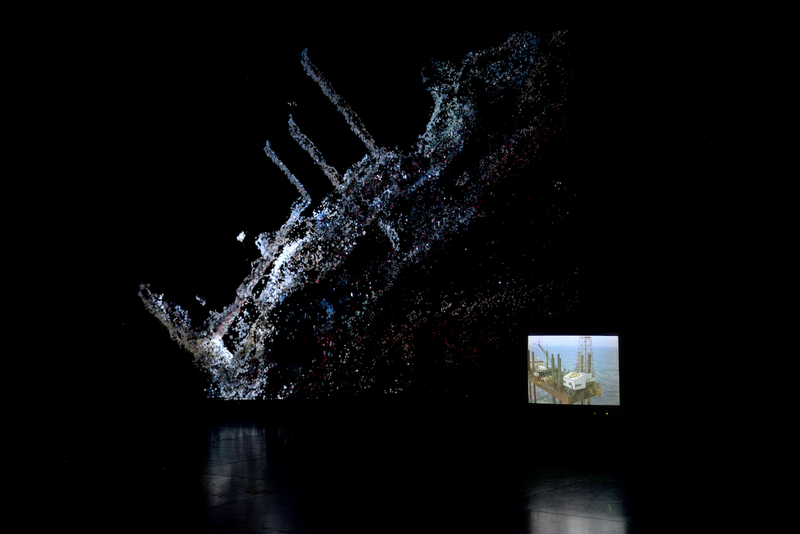 A 3D point cloud of Sea Gem has been created from archive film footage of the exploratory drilling rig before it sank in 1965. 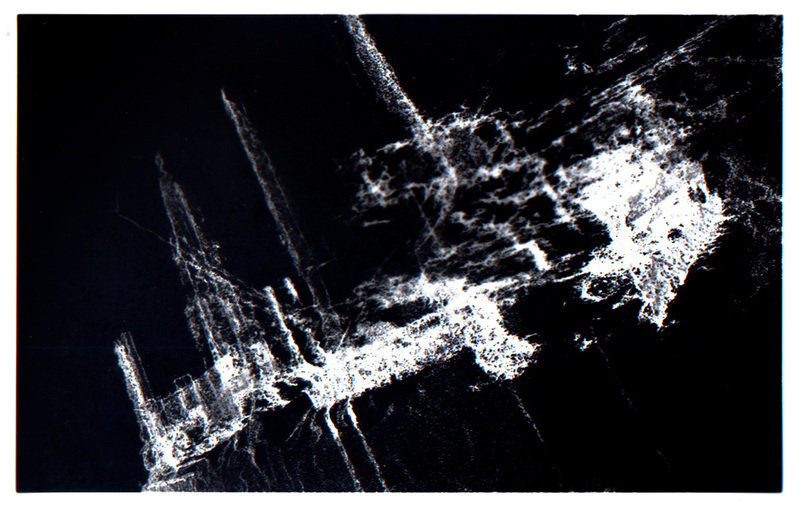 It was created through a process of photogrammetry using still frames taken from the digitised film. 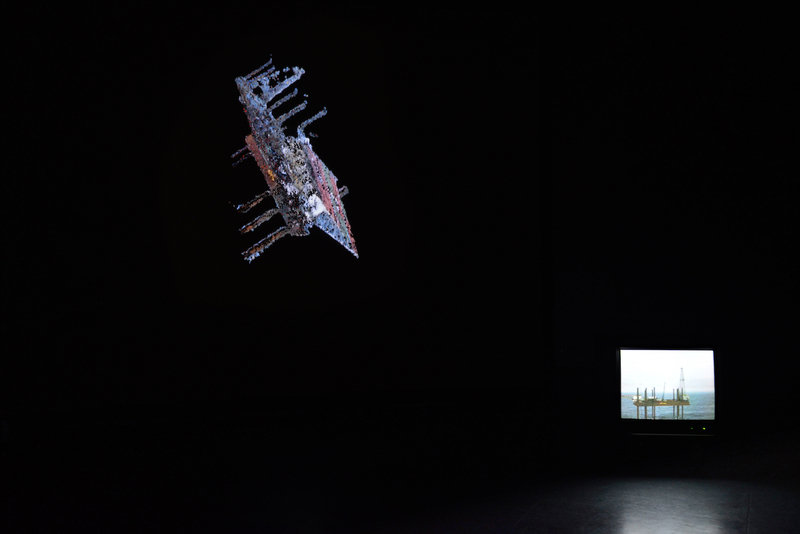 The points of data created compose a site between the historic material, its location in the North Sea and the screen on which it is realised. 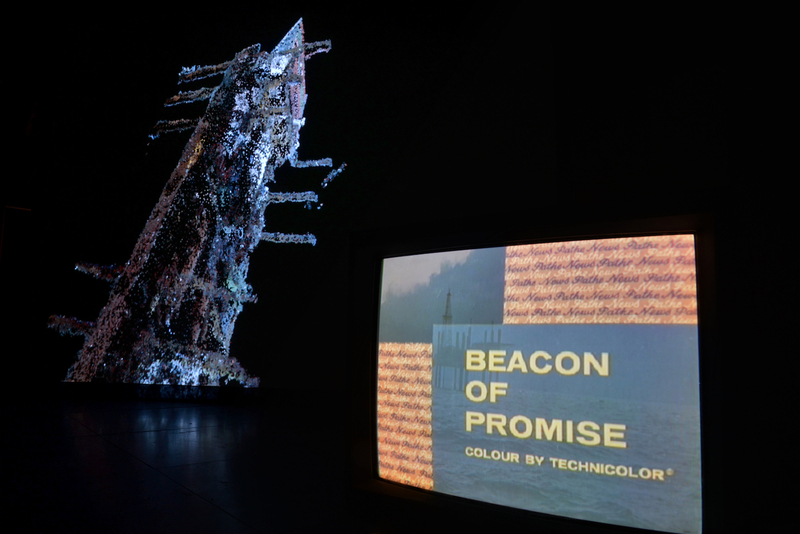 Sea Gem [1965-now] consists of a projection of the point cloud and the archive footage from which the model was created is displayed on a CRT monitor. 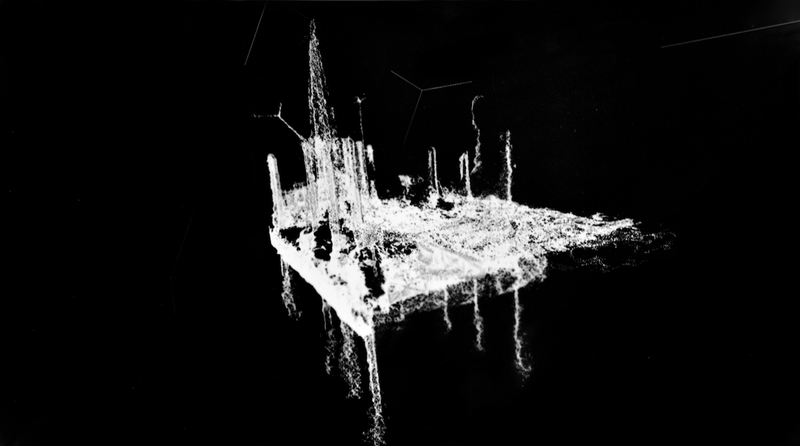 The 3D point cloud is animated by live data from the North Sea and the position of the moon, its scale and position continually changes and in unrepeatable variations that reframes it as series of unique events. 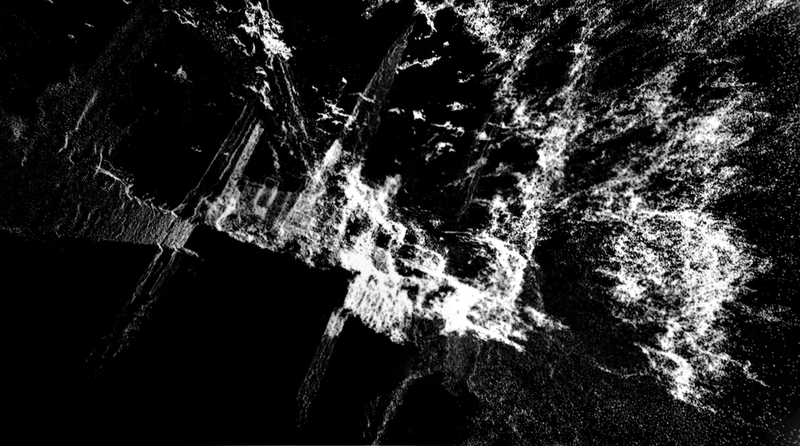 The playback speed of the archive video is linked to the amount of the movement in the point cloud- so that when there is a lot of movement the playback accelerates and when the movements and density of points decreases so does the video. The speed varies between a frame-by-frame progression through the footage and rapid blur of images. 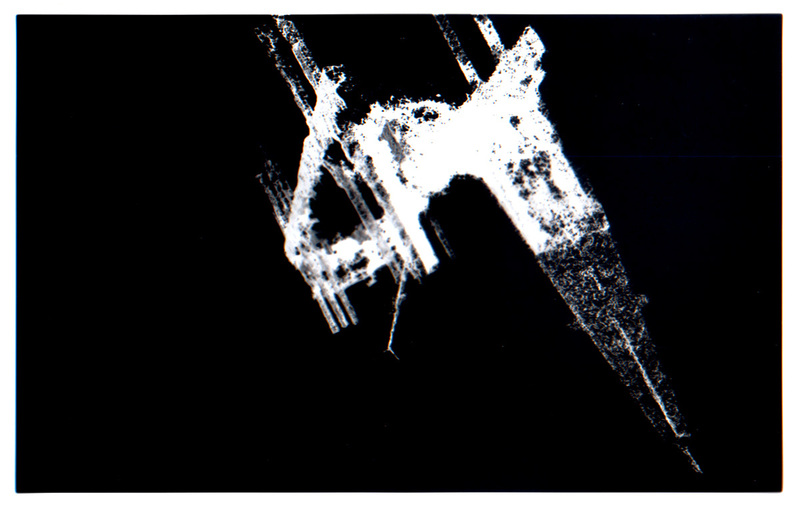 These changes also affect the pitch of the sound track shifting it from a high-pitched squeal through to an almost subsonic drone that accompanies the constantly changing movements of the point cloud of sea gem. 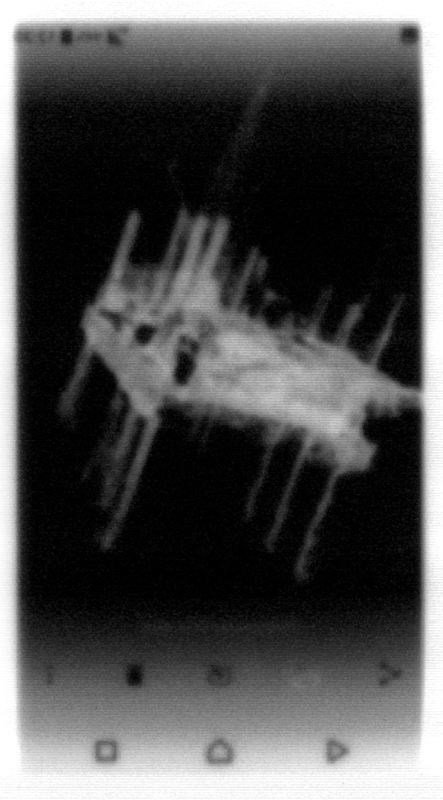 This series of images are black and white contact prints created by placing photographic paper directly onto screens displaying the point cloud of sea gem. Each screen is a differnet size and has differnt qualities that contribute to the composition of each image.